Woohoo! It's the 20th of the month, and it's time for another Ferreira Fest, the big celebration of the acting career of Louis Ferreira (Justin Louis)! We have news, photos, Q&As, our exclusive Reading Series, international and Friends news, and some early works screencaps. Grab a pineapple cocktail at the open bar and come on in! MOTIVE Season 2 starts tomorrow on US TV's ABC Network! The long wait has finally ended! Be sure to check your local listings for the exact times. The first episode, "Raw Deal" will also be repeated on Sunday night - be sure to check for the air times in your area. And don't forget to check the official web pages for MOTIVE on ABC and CTV and on Facebook! This year's Leo Awards nominations have been posted and Louis is up for Best Lead Performance by a Male in a Dramatic Series! Scroll about halfway down the page to see him listed for the episode "Fallen Angel". Of course for us that's not even a point of discussion - it's a complete no-brainer - but it's nice to see that his work on the series is getting some well-deserved recognition. So if you want to help Louis' Leo nomination along you can vote for MOTIVE in the Leo Awards People's Choice Program. Anyone can vote, but only BC residents can win the prize package. There is also some lively posting about MOTIVE going on at TVtag.com - check it out! Our researcher Agi found the following Season 1 caps at screenspy.com. Click on the thumbnails to see the original posts and large images! If the links don't work, try copying and pasting the URL directly into the web address line. MOTIVE Season 2 starts in the UK on Universal Channel on June 9th! Louis' latest short film project is nearing completion! Update on Through The Pane for all of you who have been supporting the project since its fruition. The extremely talented Sam Hulick has pretty much completed the music for the film now, and it is just BEAUTIFUL! It's now in the hands of an exquisite sound designer for an awesome unique ending to the film, and Jon Silverberg will be adding final credits before we wrap things up! Then, HELLO FESTIVALS! I've been working diligently on the Press Kit today, and once I have necessary info from Miss Christina, Freddy, Bob, Louis Ferreira and Juan Andres Hodgson this will be ready to go to print for mail outs with DVDs. It has been six months in the making, but well worth all the time and effort, and thank you again for all your support my dear friends, family and acquaintances (in particular Brandon Colby Cook and Gabriel Paul Napora whose advice and guidance have been invaluable). Thanks for the update, Pauline! We're all looking forward to seeing the results soon! Jun 6th: "Feels Good To Be Kind" Book Launch - This family friendly event will include an appearance by “Feels Good to be Kind” main character Aunty B (Khalilah Brooks) and a chance for kids to skate with their favourite character. Partial proceeds from event books sales will be donated to The Children’s Aid Foundation. Read the official newsletter The Buzz with tons of info! Donate to The Children's Aid Foundation by clicking on the banner below! Remember, you will receive a small Louis-related gift for your contribution which is also tax-deductible. By now the much-anticipated renovations at The Good Neighbours' Club are in full swing! Our friend Lauro Monteiro reports that major construction is happening to waterproof the basement and install an elevator. They expect the work to last most of the summer. Please help out with the upgrades by clicking on the banner below. Remember, you will receive a small Louis-related gift for your contribution which is also tax-deductible. This month we have another young reader's question. Today it's from Kayla (14) from San Diego. Thanks for your question, Kayla! FF – And there’s a question from Kayla, from San Diego, California. LF – What was my favorite subject in school? LF – I loved gym. Loved gym. Loved gym! Loved the… yeah. FF – A lot of the physical activity. LF – Well, yeah, I was all about the gym. What else, in what, grade school or high school is she asking? FF – She just says in school, besides drama class. I’m assuming, well, she’s fourteen, so probably middle school, high school? LF – Fourteen? I didn’t start drama class until I was, yeah, grade nine. So, yeah, around that age. I was definitely a theater, music and gym, those were my three subjects I loved. Very much. I didn’t mind geography as well. I like geography. Louis posted a lovely picture on Mother's Day, May 12 2014. Click on the image to go to his original post. Here he talks about his tribute to mothers everywhere. FF – I loved your Mother’s Day photo that you posted on Twitter. LF – Yeah. I did that last year too. I have a thing for the female Mother Earth energy. I’m all about it. FF – Right. Is that your mom in the picture I assume? LF – Yeah. That was my mom. FF – Do you remember what year that picture was taken? LF – Probably in 2002. I used to take my mom up to Muskoka. My mom never got out that much, so every time I took her, I’d just serve her and she loved the idea (chuckle). Click on the images to see the original posts (or more like them). Louis shares this old agency photo in the style of The Outsiders, which also happens to be a favorite movie of his. "Can we go walkies? Please? Please? Pleeeeeeeease?" Louis spent a Sunday in Venice Beach, hanging out with a couple of Minions. During the filming of a MOTIVE episode that took place in a pawn shop, Louis found a scooter that really wanted to follow him home and be his new BFF. Louis does his share of the work of feeding the crew from a food truck during the filming of a MOTIVE episode. A different food truck visits the set every Friday. Between takes during the filming of a MOTIVE episode. Oscar Vega sports new glasses in Season 2. Behind the scenes of MOTIVE: script work between takes during the filming of Season 2. 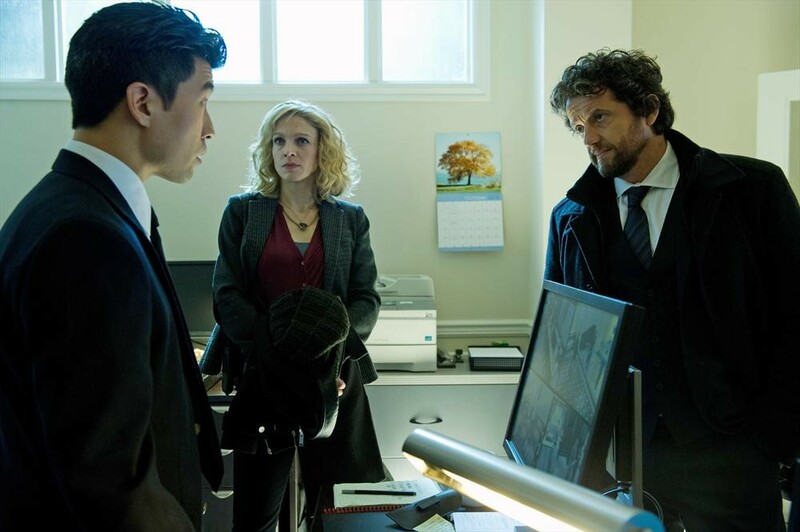 Behind the scenes of MOTIVE: Director Andy Mikita, Louis Ferreira, Lauren Holly and Kristin Lehman. All smiles with Kristin Lehman at the CTV Upfront event in 2013. See Ferreira Fest 42 for more info. Another one in the "Selfie" series with Lauren Holly. Check out the photo section in Ferreira Fest 52 for others! Ali Liebert shared this great photo of Louis with the guest cast of Season 2's episode 11. Hey Lauren - the rest of it ain't bad, either! Kristin tells it as it is. Pssst, Lauren... that's not a bad thing, you know? King and Queen of banter! My dog has no questions about his right to his space. He knows his territory, and he protects it. Munchie's intention is so strong that he intimidates big dogs. Sometimes a Doberman comes around, and she yields to the Munchie Security Service. The fact that he is no bigger than a rabbit doesn't matter; he knows his rights, and his neighbors honor them. The record for Louis' role on the show was added to his IMDb page only last month. Miami detective George Cadavid (Matt Birman) walks into a shootout at the mall; Illinois policeman Bill Willis (Vlasta Vrana) works the case of a kidnapped businessman buried alive by the delinquent Danny Edwards (Louis Ferreira); and Andrea Huff (Taborah Johnson) steps out in her first experience as a hostage negotiator in North Carolina. A million thanks go to our archivist Alma for doing some diligent digging and finding this fantastic gem! Here's what Louis remembers about the role - almost 25 years later. FF – Do you remember doing the show Top Cops? LF – Ah, I mean, vaguely, but I remember I did it, yeah. FF – So that’s like your "Early Jurassic Period", right? LF – Yeah, it sure is. FF – Do you remember anything about the role, at all? Danny Edwards was the character name. LF – I was a bad guy. And I think the story was something, this was true stories about cops that did extraordinary cases and I think, I’m pretty sure I was a bad guy. If I remember correctly, we, or I, the bad guy, had buried a person alive. Yeah. And then, somehow the cops got to me and then I led the cops to where the place was. That’s what I remember. I could be wrong. You know, funny enough, I think the director who directed me in that episode is someone that I’ve seen several times because he’s good friends with my buddy Peter Onorati and I think his name is Gil Shilton. And Gil is someone I see, he teaches all the time, he goes overseas and teaches stuff, so I think that’s the guy who directed that particular show, so that’s funny. And to celebrate this amazing blast from the past here are 655 screencaps from Top Cops. The image quality is not the best, but remember - this show was done around 25 years ago and video tapes deteriorate rather quickly. Rob's new show Gang Related premiers in The US this week, on Thursday May 22 at 9pm on FOX. Rob is a consulting producer and also wrote two episodes. Check out a publicity image with Rob and others from the series on GettyImages. Browse the Official Gang Related website for lots more info, clips and pictures! Visit Rob Munic's page here at The Friends of Louis Ferreira! Hope you are doing well. I'm in Australia working on a play called BENEATH THE SOULSKIN, an original piece. Lots of fun, I get to play seven different characters, a wonderfully fun challenge. I'll be here until the beginning of May and then I'm back working on post production on Thai-Sanity, my feature film directorial debut. Lots of fun stuff going on! Watch the trailer for Beneath The Soulskin. Visit Bradley Stryker's page here at The Friends of Louis Ferreira! DOWN RIVER played at the SoHo Film Fest last week. There's a great interview with director Ben Ratner as well as a good review at Influxmagazine.com. Another interview with Ben can be found at jewishindependent.com. Watch an intro to the movie on YouTube. DOWN RIVER has received 13 Leo Award Nominations! Jen earned a nomination for Best Supporting Performance by a Female in a Motion Picture. You can vote for DOWN RIVER in the Leo Awards People's Choice Program. Anyone can vote, but only BC residents can win the prize package. Jen's series CONTINUUM has received 21 Leo Awards Nominations! Jen earned a nomination for Best Supporting Performance by a Female in a Dramatic Series for the episode “Second Opinion.” The show is currently airing on SYFY (Friday @ 10pm EST) and on Showcase for those in Canada. Be sure to check your local listings for the exact times! Visit Jennifer Spence's page here at The Friends of Louis Ferreira! Want to meet Peter in person? He will be at Tyler Rose City Comic Con October 25 and 26! David Blue has done two of his fabulous Out Of The Blue podcasts with Peter. Check them out - they are very entertaining and a lot of fun! Peter also posted this fabulous photo on Twitter. Visit Peter Kelamis' page here at The Friends of Louis Ferreira! Not much else is going on in Hungary. Stargate Universe is still on AXN Black's program, but only reruns of the episodes are shown, and quite late during the night. Thanks for the news and the great video, Ildi! Season 2 of MOTIVE is expected to air in France as well, probably by the end of the year. MISSING ("Disparus sans laisser de trace") is being rebroadcast right now on the Paris Première channel. Check out the listings here. You may have to click on the redirect link in the upper right hand corner if you land on an ad at first. Note: Louis' co-star Caterina Scorsone who plays Jess Mastriani in MISSING is the daughter of Dr. Bruno Scorsone who runs the Good Neighbours Club, one of our official charities! Thanks for the news, Anne! Feeling a little tired lately? Your "get-up-and-go" got up and went? How about a Vega bar to help you get through the 2pm slump? If nothing else, it might bring a smile to your face. Thanks to Louis' former Stargate Universe colleague Josh Blacker (he played the ill-fated Marine Sgt. Spencer) for posting pictures on Twitter! PS: Oscar Vega was not harmed in the making of these energy snacks. Yum! As of press time we now have readers in 53 countries and 229 different regions. Know of any other Louis fans in other countries? Send them our way so they can add their flag to our collection! Click on the flag collection in the side bar of the Home Page - then check all the country listings under the Details tab. If statistics are your cup of tea the Flag Counter will send you into orbit! Well, friends, that's about it for this month. Thanks so much for stopping by! Please let us know whether you've enjoyed this issue! We are always looking for volunteers who want to help, and there are perks associated with being a correspondent or staff member! Want your own email address at louisferreira.org? Contribute - it's that easy.